IPCC Synthesis Report: you’ve been told! The IPPC Fifthe Assessment Report (AR5) is found here. 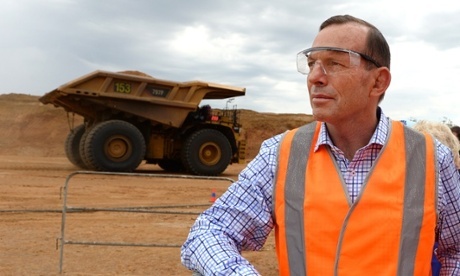 acting on climate is ultimately an ethical, not an economic, consideration. Insufficient policy action is a declaration of self-interest, condemning our children, grandchildren and the planetary system that supports them, to a dystopian future. That’s what the report should say. “Leaders must act. Time is not on our side.” He said that quick, decisive action would build a better and sustainable future, while inaction would be costly. The G20 is the most effective forum for the discussion of the growth story of the future, the transition to the low-carbon economy. Yet the local politics of a country of less than 25 million is being allowed to prevent essential strategic discussions of an issue that is of fundamental importance to the prosperity and well-being of the world’s population of 7 billion people. essentially what the IPCC is saying to Australia is, on its current policy settings, ‘wrong way, go back’. Instead of dealing largely in forecasts and responses, as in previous syntheses, it now frames the climate problem squarely in terms of risk management. Jones then identifies some of the myths the report busts. 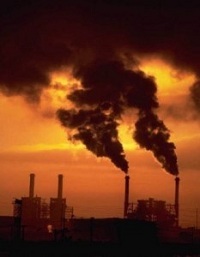 Roz Pidcock at The Carbon Brief identifies what’s new and interesting about the report. C. Forbes Tompkins and Kelly Levin at Climate Code Red list 9 significant scientific findings too recent to be included in the new IPCC report. Two of them relate to sea level rise, an increased fragility of both the Greenland and Antarctica ice sheets. There are more links at the end of the post. I wish to comment on the appropriateness of the 2°C guardrail, the view of risk taken in relation to the 2°C and then some conclusions. Is a 2°C temperature rise safe? The tipping point for Greenland Ice Sheet has been revised down to +1.6ºC (uncertainty range of +0.8 to +3.2ºC) above pre-industrial. We are likely to hit +1.6ºC within a decade or two. It has been shown that “preserving more than 10 per cent of coral reefs worldwide would require limiting warming to below +1.5°C (atmosphere–ocean general circulation models (AOGCMs) range: 1.3–1.8°C) relative to pre-industrial levels”. Large-scale thawing of permafrost may have already started, but a 1.5ºC global rise in temperature compared to pre-industrial should be enough to start a general permafrost melt. Current levels of CO2 at about 400 ppm place us in the Middle Pliocene epoch (3.0–3.5 Myr ago) when sea levels were 25m plus or minus 5 higher than now. During the Eemian 123,000 years ago sea-level rises of 3 metres occurred within 50 years due to the rapid melting of ice sheets, when the energy imbalance in the climate system was less than at present. Based on current understanding (from observations, physical understanding and modelling), only the collapse of marine-based sectors of the Antarctic ice sheet, if initiated, could cause global mean sea level to rise substantially above the likely range during the 21st century. There is medium confidence that this additional contribution would not exceed several tenths of a metre of sea-level rise during the 21st century. On sea level rise unfortunately for the next seven years we will be quoted the means given in the tables, without the qualifications, which themselves are inadequate in the late of the latest science. So the talk will be about half a metre, or up to a metre maximum. For these and the other reasons quoted, plus a few I didn’t highlight, a 2°C guardrail looks foolhardy to say the least. Much of the same information is given in the table on p23 (Short Report) and footnotes. In other words a 33 to 66% chance of staying below 2°C, or if we act quickly and drastically a 66% chance. When you consider the implications even of a 1.5°C climate, this is desperately insane and simply not acceptable. David Spratt suggests a risk-averse (pro-safety) approach, say, of less than 10% probability of whatever target we deem appropriate. I’d suggest a less then 5% of a 1.5°C temperature rise and then see whether that is doable. Are we game to talk about what really needs to be done for a liveable, sustainable ecosystem for future generations? Or are we going to continue eating our children’s future? Back in 2007 environmentalist Bill McKibbin asked James Hansen what the appropriate levels of CO2 should be. 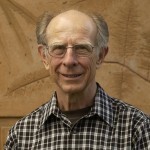 Hansen gave his answer in December 2007 at the American Geophysical Union meeting. At that very time the UNFCCC Conference of Parties was meeting in Bali. Hansen’s response was that we had overshot and that we should aim at 350 ppm by taking CO2 out of the atmosphere. To clarify, Hansen’s answer assumed that we would achieve net zero in other greenhouse gases, so he was really talking about CO2e. McKibbin went off and started up 350.org. In a strict sense the IPCC Report is agnostic about a 2°C guardrail. It simply identifies risks, vulnerabilities and impacts at various temperature levels. However, when it comes to mitigation scenarios, it deals with what is out there in the scientific literature. Here it seems the vast bulk of the modelling contemplates scenarios where the 2°C guardrail is simply part of the furniture. Yet what has been called CCS (carbon capture and storage) and the report (see Short Report p.15 for example) re-badges as CDR (carbon dioxide removal) is also part of the furniture. It seems to me that the scientific community is struggling to catch up with where Hansen was seven years ago. Perhaps they are concentrating on what’s doable, but at the same time they are holding out false hope. While the world’s scientists and governments have issued their bluntest warning yet, we seem to be letting go the idea of a safe climate. I heard head honcho Rajendra K Pachauri on the radio saying that we only had a budget of 275Gt of carbon (that’s about 1000GT of CO2) left that could be used. In fact, rationally, we don’t have a budget at all, we are in the red. Rationally, all the fossil fuel reserves should be left in the ground – all of them, unless offset with CCS or CDR, for which our visionary PM has just slashed the research budget. Al Jazzeera rounds up some of the opinion warning that 2°C is foolhardy and dangerous. That last link from The Carbon Brief is quite comprehensive and includes a list of their six posts. Crisis or catastrophe? What will the IPCC say? I feel a bit awful dumping on the work of so many scientists, but I feel even worse about the odds being offered and, for example, no realistic plan to save coral reefs. It occurs to me that CCS would apply to capturing carbon while producing power, whereas CDR is a broader concept. Brian: One of the really damaging things people can say is “If only those people would…” It is disabling because the message is that I (or you) haven’t got the power to do anything meaningful. In this context, my problem with the IPCC is that its basic message is that someone else (in this case world governments) have got to act if there is to be any chance of saving the planet. I have similar problems with those calling for an international ETS, legally binding world agreements etc. etc. So perhaps it is worth asking whether the IPCC has reached it used by date or at least a point where its role should change radically? John, three things. 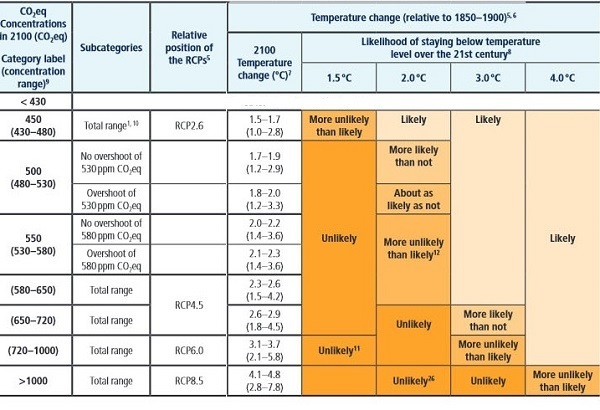 First the IPCC Assessment Reports provide a useful compendium of the state of play in any particular area. However, the cut-off point means they can be out of date. I’m not sure what the cut-off was for the latest, but I suspect about December 2012. Secondly, the Summaries for Policy Makers go through a political filter which requires consensus. So all must agree. As such they provides an indication of the state of play. It’s surprising that the text is as forthright as it is. Third, I think much of the problem is in the nature of science itself. Inherently conservative and usually narrow in its focus. You don’t get many like Hansen in the US and Kevin Anderson in Britain who take a broad view and tell it like it is. If the Earth reaches a 2 C rise, positive feedback cycles — which refers to impacts from warming that lead to even more warming — would likely be triggered. David Spratt points out that the sea rose about 20 metres pewr degree coming out of the ice age. It’s not a matter of if, but when.